The new rules for dressing? There are none. Warehouse fringe shift dress (also seen here), Lord and Taylor geo print skirt (also seen here), ASOS studded leather jacket (on sale here), Lauren by Ralph Lauren bucket bag (similar here), Chinese Laundry mules (on sale here). Shot by Erica Lavelanet. Hair by Patrick Kyle at Nexxus NY Salon. Next up: find strategies to breathe new life into your 'old' duds that you decided to keep. Have a cool, fancy dress you never wear? Check out my tips for dressing down even the fanciest dresses here. Own a couple skirts (like the one above) or pants you're sick of styling in the same way every day? Layer a tunic or dress over them to switch things up. Mix prints. Add some flair like buttons, pins or patches (just don't go overboard). Try switching up your usual footwear and wear sneakers with your dressy duds, or heels with your casual looks. Bottom line: don't be afraid to shake things up! Chances are, it's not your closet that's getting in the way of your style, it's your mindset that is. Dig your leather jacket girl! So true and I have sold many an item to Cross Roads and Buffalo Exchange on both coasts. 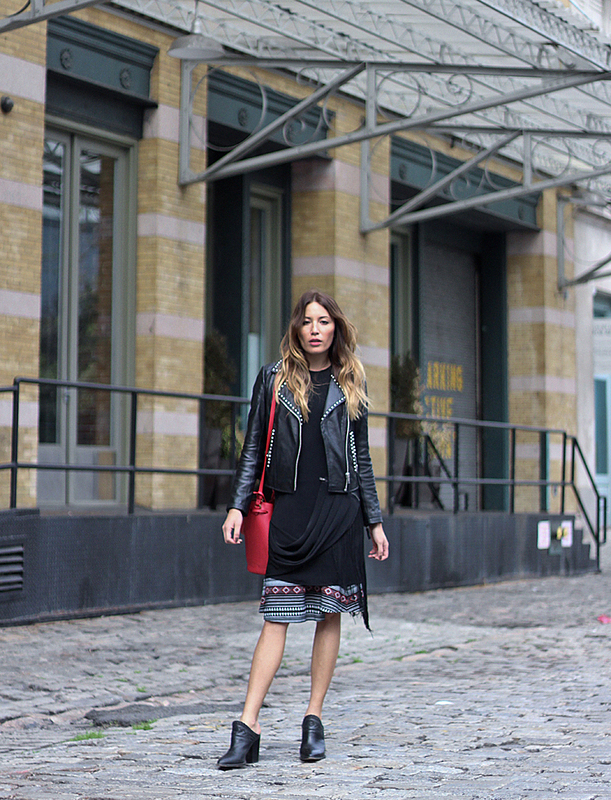 Love this layer look and the red bag.